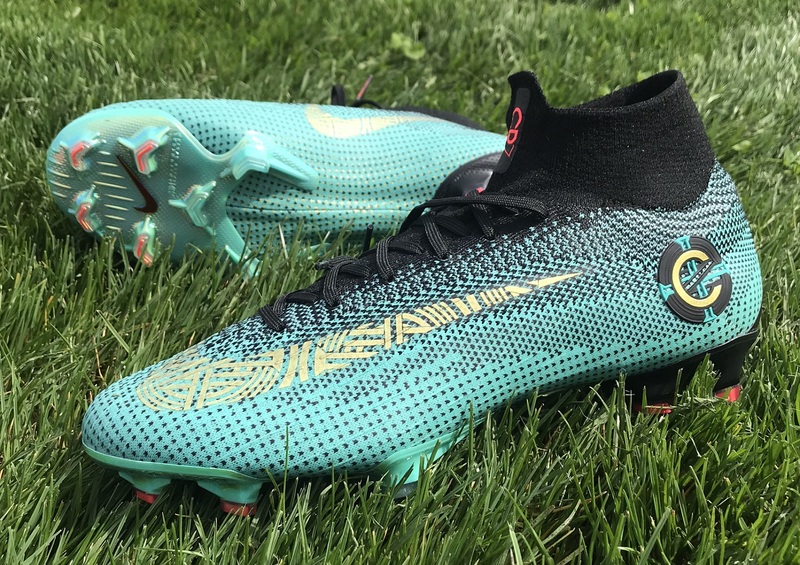 The latest Chapter in the story of Ronaldo told through boots is officially listed as a Jade/Gold/Black/Turq/Red, with a wild mash of colors covering right across the upper. It is a very different look! 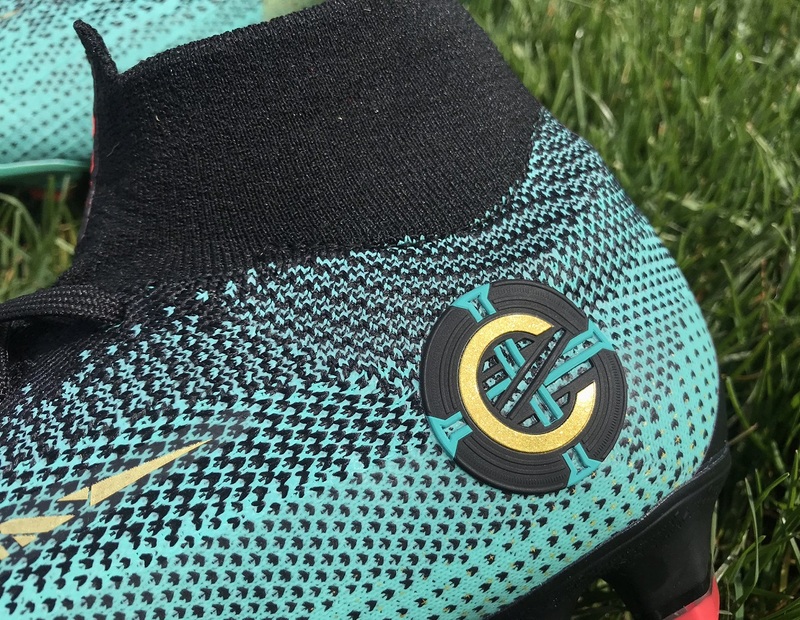 Included in the standard Nike box you get a special issue black CR7 boot bag that features a gold armillary sphere graphic. He captained Portugal for the first time on February 6, 2007, the day after his 22nd birthday. The following year, he became the federation’s standing skipper and has since gone on to set the record for most captaincies of his country — a record he extends with every Portugal appearance. Even when injured and unable to play (as he was in the final of the 2016 European Championship), Ronaldo has made a positive impact on his team through his leadership. 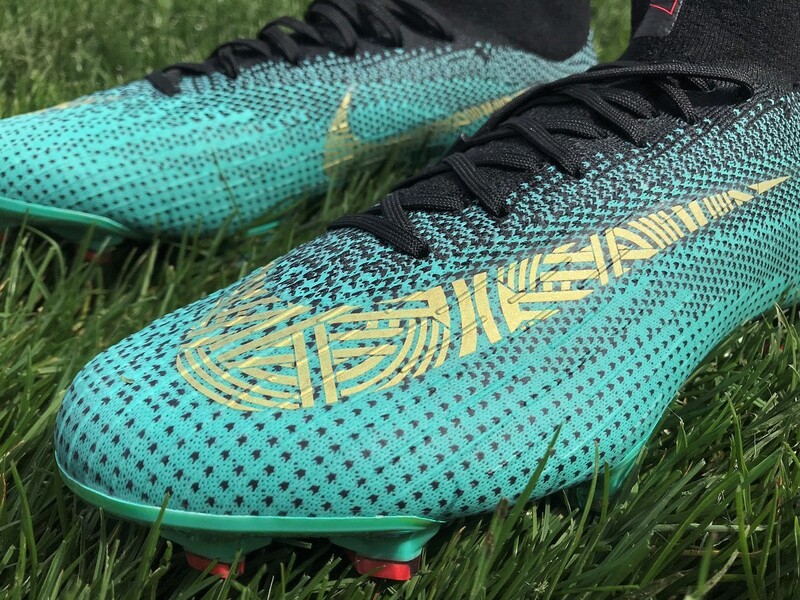 Compared to previous Mercurial releases, this boot is a lot more accommodating and provides some additional width to suit a wider audience. In saying that, they are still a Mercurial geared toward speed, so the silhouette is intended to be sleek and aerodynamic. I have a medium/wide fit, and they felt just “OK.” Through the forefoot, I had the right amount of space for them not to impact performance, but I can’t say with confidence that the same would be true for a wide fitting player. If you have the chance to try them on, I’d definitely recommend doing so before buying. A nod to Portugal’s historical sea exploration lies within the Swoosh. On the lateral side of the heel, the captain’s “C” is incorporated into a raised applique of the sphere (an armillary sphere graphic is also featured on the boot bag). 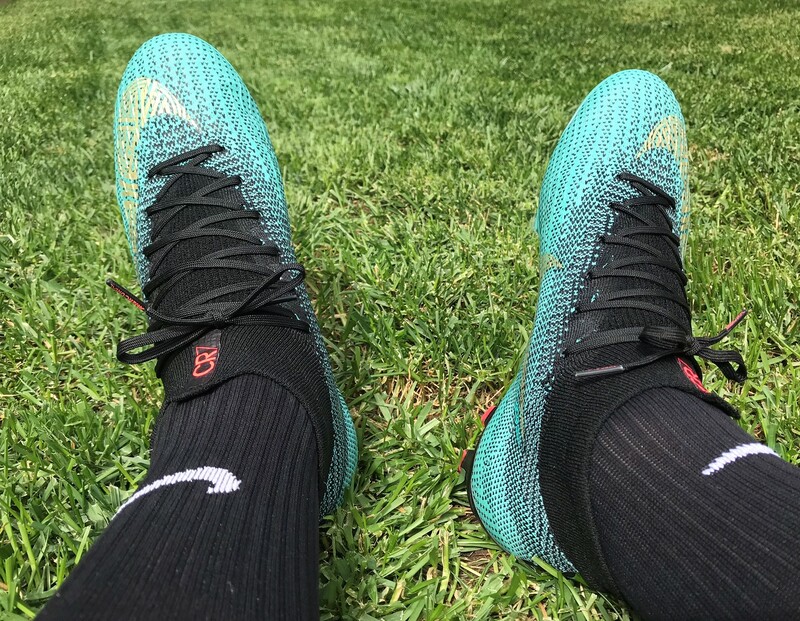 Black at the collar blends to hyper jade toward the sole making these the first Mercurial 360 boots to feature more than one knit color. The cross on the heel tab ties back to the cross within the Portugal National Team collection. The cross pattern underfoot the Mercurial 360 is aligned with the pattern on Portugal’s new away jersey. How Does The Upper Feel? One of the things Nike did with this release was infuse ACC into the Flyknit upper material, essentially eliminating a layer. That is in theory. But what it actually does is make the upper more rigid, meaning you are losing out on the natural level of touch on the ball. After a wear wears, the material does loosen so it becomes less of an issue. The addition of micro-texturing across the Flyknit provides extra traction on the ball. You can see it clearly in the images above, and it really is as prominent as it looks. This helps increase control at top speed. The texturing is extremely defined, way more than you’d expect. They sit in a series of horizontal lines down toward the toes. Whether you are looking to add some additional swerve on a shot or a little extra power on goal bound strikes, it plays a positive role. The additional surface area allows you to really wrap your foot on the ball when you need to add a little spin. And for players in need of a power style boot, dare I say you get some additional ping of shots thanks to its placement through the strike zone. In completing the overall package, Nike decided to add a special iridescent style effect on the soleplate. We are talking a shimmering green, that almost looks like a rainbow trout skimming through the water under sunlight. Visually, it is really stunning. 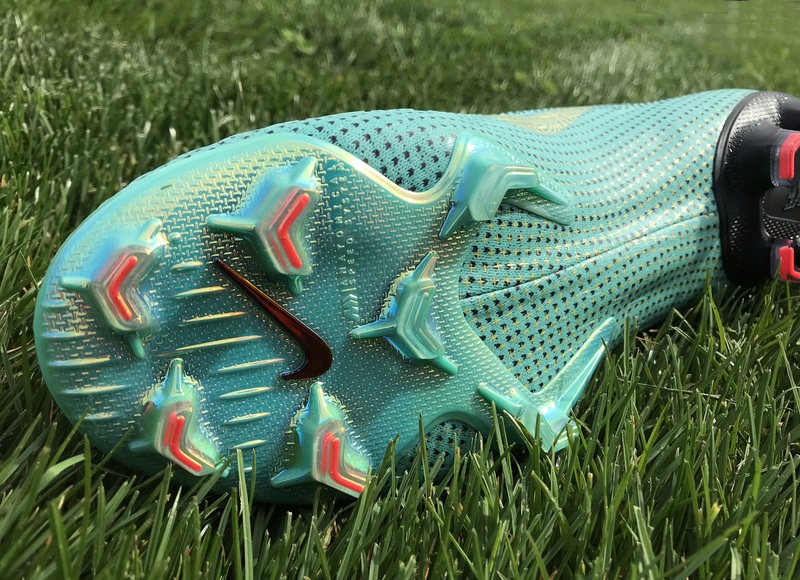 From a performance perspective, there is a lot of undulation featured on the insole of the Superfly VI, something we also saw on the Superfly V. This is part of the dynamic internal system used by Nike to create a “Racing-seat-like” fit. 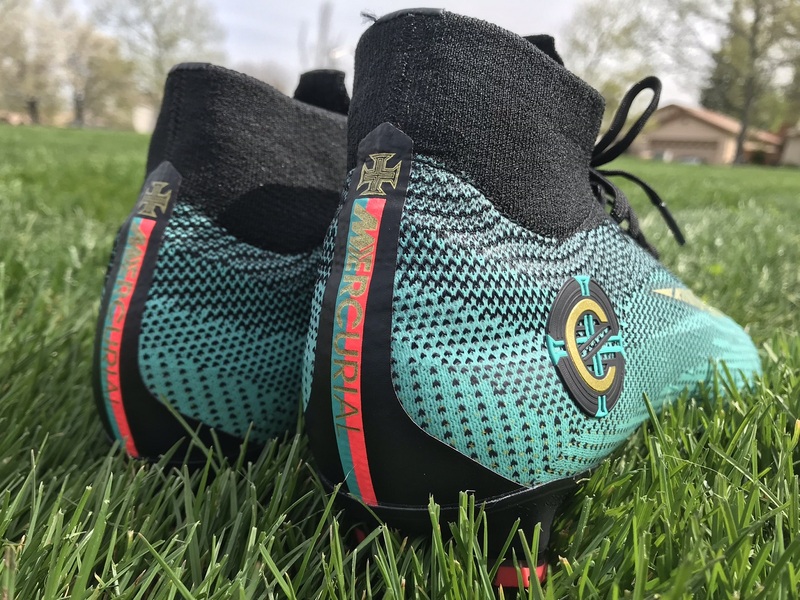 Coupled with a split soleplate chassis and Chevron studs, everything on these is built for explosive speed and sharp deceleration. This is one of the more distinct CR7 specific releases to date, primarily because it is associated directly with a country. You get the iconic Portugal colors across the upper, as well as a stylized flag that runs down along the heel. 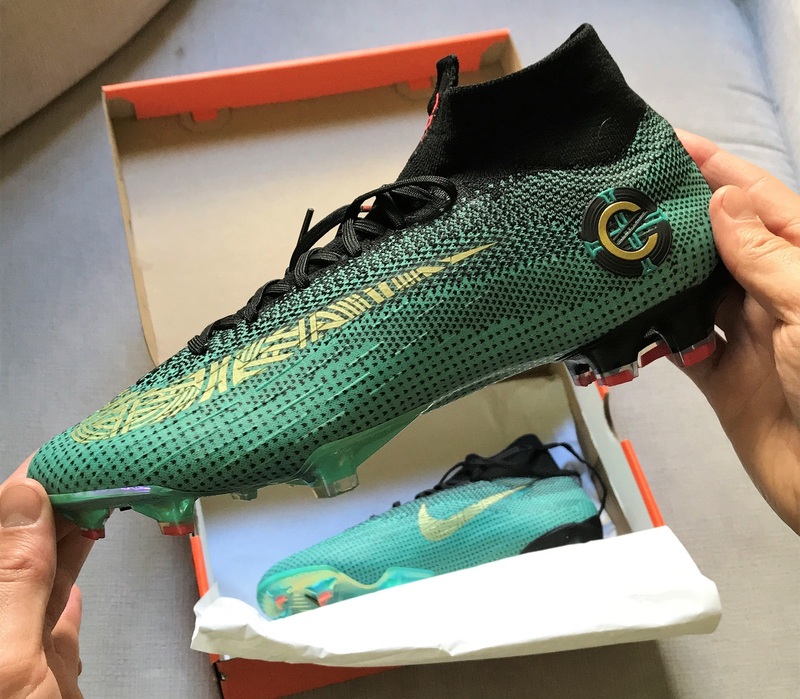 For those with a direct connection to Portugal, it is added incentive to want a pair. Everything else about the silo replicates the standard issue release, so performance is not any different. In terms of the six releases in the series to date, I wouldn’t place these as a favorite. But, they definitely stand out in a positive way. The pattern across the upper is so unique and the soleplate is delicious. As a special edition release, remaining pairs are already pretty limited. Thoughts on this colorway? Are you a fan of the Portuguese inspired design? For more details, makes sure to check out our Nike Superfly 360 Elite Boot Review.